On big expeditions a good sleeping bag is perhaps the most important piece of equipment that you carry. A sleeping bag does a great deal more than to simply keep you warm at night. It becomes a means to keep water bottles from freezing and provides a way to dry out damp clothing and boots. And indeed, in an emergency it might be the last shield between you and hypothermia or even death. So what kind of sleeping bag should you invest in? Down or synthetic? Synthetic or down? Many would argue that nature does it best. Down (either goose or duck) tends to be significantly warmer than a synthetic alternative. Ounce per ounce, down tends to be approximately three times warmer than synthetic. If you take care of it, down retains its shape and loft. With proper care a down bag can last a lifetime. Down tends to wick body moisture away which can make for a far more comfortable night's sleep. Down is far more compressible and lightweight. The nature of down is that it keeps you warm in the cold and cool in the warmth. 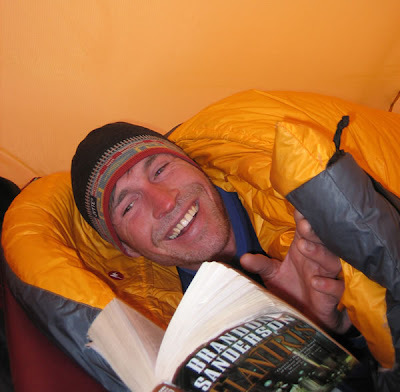 AAI Guide Justin Wood enjoying a book in a down bag on Denali. The largest disadvantage to a down bag is how poorly it deals with water. A wet down bag is close to useless. Those who elect to use down in a wetter climate need to have all of their systems dialed. In other words they need to be very good at protecting their bag from the elements. Once wet, down bags don't dry easily. Down can be difficult to clean. If it is improperly cleaned it may break down and lose its loft. Be sure to read and follow all washing directions on your down bag. Some people have allergic reactions to down. Synthetics are more weather resistant and dry more quickly. Synthetics are easier to care for. There is a lot of variety out there and it tends to be less expensive than the alternative. Synthetics tend to be heavier and bulkier than down. Many synthetics don't pack down as tightly as down. Synthetics tend to breakdown and perform poorly over time. Some of the lower end products may not fit well. So which is better? Most guides use down bags, but they know that they have to be hyper-aware when it comes to getting them wet. If you don't think that you can do this, then a synthetic bag is the way to go. The purchase of a sleeping bag is a big financial decision, but that shouldn't be the deciding factor. Instead, it should be based on where you think you're going to use it and what type of conditions you think you're going to encounter the most.